Cochlear implants and hearing aids both have the same basic purpose to improve the hearing and well-being of those who suffer with hearing loss. Hearing aids amplify sounds that the microphones pick up and pass it through the receiver into the ear. Cochlear implants also pick up sounds through a microphone but pass the signal directly to the cochlear in the inner ear. 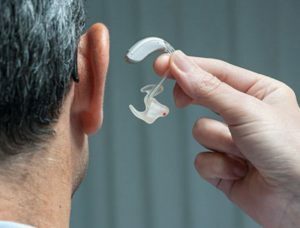 For those suffering from severe damage to their cochlear, a hearing aid may not help as the hearing aid is passing audio through the damaged nerves of the inner ear. The cochlear is the part of the inner ear which controls the auditory functions. The cochlear looks like a spiral which is why it’s named after the Greek word for spiral. There is liquid inside the cochlear which pass vibrations from the middle ear across hair cells which convert it into electronic signals which are processed by the brain-stem. Cochlear implants aims to try to alleviate the symptoms caused because of damage to the hair cells within the cochlear itself. Once the hairs in the cochlear get damaged, unfortunately they don’t recover and can cause severe and life long hearing loss. 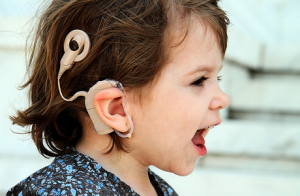 The aim of the cochlear implant is to bypass the damaged sensory cells to improve patients hearing that would not be able to with a hearing aid. Hearing aids are devices that amplify external sounds and then pass it through to your ear using a receiver. They come in many styles, from Behind the ear hearing aids to tiny devices that sit directly in the ear canal. Hearing aids can be used from mild to severe hearing loss and your local hearing practitioner can advise which is the best hearing aids for your needs. Everyone benefits differently from Cochlear implants and therefore each individual will have different results from the procedures, here are some of the advantages that people with severe hearing loss have reported after having a Cochlear Implant treatment done. Ability to hear environmental sounds such as the doorbell of phone ringing. Avoids the issue of comfort and the moulds of a hearing aid not fitting correctly. Cochlear implants costs are covered by Medicare but there can be out-of-pocket expenses from the hospital itself. It’s worth making sure you have a right health insurance policy to meet these costs or 457 visa health policy if your in Australia on a temporary working visa. The cost is the number one reported disadvantage of the Cochlear Implant. In Australia the cost is around $25,000 – $50,000 but those with private health insurance may be covered for partially or the whole amount. Because it requires a surgical implant there is inherent risks involved in the surgery for cochlear implants. The only solution that is right for you can come from speaking to a qualified local Audiologist or qualified hearing specialist. Every situation is unique and needs to be assessed by a competent practitioner that can take your unique circumstances into account. Cochlear implants is a surgical procedure so weight has to be given to a wide variety of complex factors before deciding that it is the right path for your hearing needs. Hearing aids also come from a range of manufacturers with different levels of technology so consult your local audiologist who can pick the right one for you. You can also give Hearing Choices a call and a qualified hearing specialist can give you free advice on the next steps you should take for your hearing needs.